News surrounding Anthony Martial’s apparent departure from United in the summer window has reduced a bit, but that is more from the virtue of news-cycles running their course. At last count, the player still attracted interest from the likes of Chelsea, Juventus, Atletico Madrid, Tottenham, and Paris Saint-Germain. All of the above are striking options for the 22-year-old, who is dissatisfied with the lack of playing time he has been receiving. His misery stems from the arrival of Alexis Sanchez in the winter, wherein his preferred attacking wide spot saw Martial exiled to the bench. However, there may be a solution to this after all. 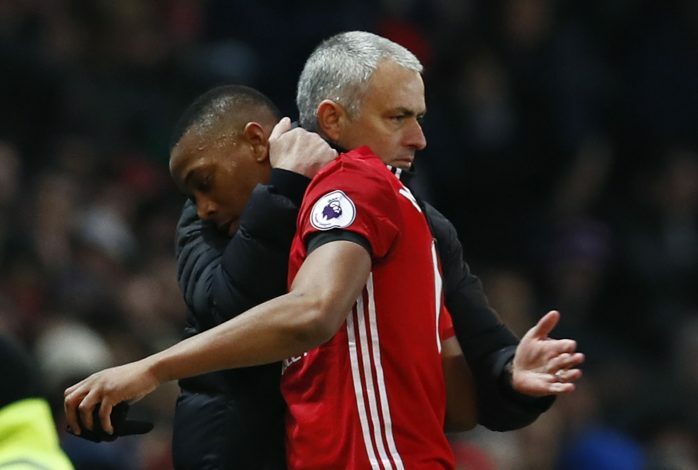 As per a report in Daily Mail, Jose Mourinho is considering offering Martial a central role next season if the Frenchman decides to stay on. The central striker position is one where he initially began his career at, occasionally switching forward. After being signed by LVG, however, the youngster saw his talents being used on the flanks, and with remarkable results. The sight of the starlet cutting into the box and confounding defenders in the process is one that has mesmerized the Old Trafford faithful many a times, and is also a feat he has garnered much success from. As of such, it will be interesting to see precisely how Mourinho will go about executing this in view of the full team. Lukaku has been phenomenal as United’s lone striker this season, and it goes without saying that a United team that will try and incorporate the likes of Martial and Rashford in non-wide positions is one that will have to see quite a few tactical changes. But the source adds that this is precisely what Mourinho has in mind, as he is not satisfied with their development in their current roles this season. However, the bigger question remains whether such a prospect will be considered by Martial as worthy enough to stay on for?